Friday afternoon, I flew out of state for my annual adoption training. Oh yes--I am a blogger, a wife, a mom of three, a runner, a professional organizer (that's a new thing for me)...and for 19 years now, I've been an adoption social worker. I work very, very part-time. But, I still enjoy the benefit of an annual conference with the agency I contract for, where I receive continuing ed hours and I reconnect with all the other staff members. This year, I was excited to meet up with another contractor, who happens to live in my home town. And, yes. We see each other annually--on this trip out of state. SO, I had much to catch up, incredibly eager to hear progress of their impending adoption. She did not disappoint, with a full photo album of beautiful pictures of their daughter. Who currently lives half-way around the world in an orphanage. The baby girl has a smile to light a room, and she is held and cared for in the photos by her caregivers in the orphanage. No doubt she is being loved. 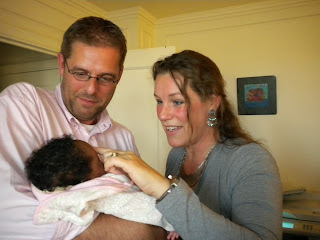 But nothing like the love of her parents and siblings who have been marking the days apart with a growing anticipation. And agony. And a dread of her upcoming first birthday where they will mark another milestone lost to them. Adoption is not for the faint of heart, in case you didn't know that. Twists and turns and roller coasters. Which come for many families after their topsy turvy road through infertility. During these 19 years in the field, I tell families the only thing to count on is that things will change. Unfortunately, a huge hiccup hit my colleague square between the eyes on Friday night. When she received word that the embassy in her daughter's home country would be closing for twelve months. Which means adoptions come to a screeching halt,if the rumor is true and enforced strictly. Babies and children sit in an orphanage. While their forever families wait with open arms and hearts, and the days apart seem cruel and unnecessary. Ironic that this adoption social worker got the news surrounded by a circle of adoption social workers. Who had no words. For all our years of experiences and the heartaches we've witnessed, we simply were stumped. Because although we hear the numbers of such cases, the faces and names and people involved will never ever cause us to feel anything but burdened beyond words. Torn for the hurting families. Impassioned for the cause of bringing parentless children to the families who wait and long to hold them. There is no consolation to offer. A mother longs to hold and comfort and nurture and kiss and hug her baby girl. Her arms are empty. She knows her daughter's basic needs are being met. She is fed and clothed and rocked to sleep. But she is not being held by the mother who mourns each day they are apart. A father dreams of nothing more than consoling his girl when she cries, cheering her every milestone, and rocking her to sleep during difficult days of adjustment. Siblings wait. To love. To play together. And even to enjoy the sibling rivalry that can be taken for granted. As I prayed for wisdom on how to reach out to this hurting family, I was struck with the truth of this situation. THIS is a picture of our Heavenly Father. THIS is a picture of His love for us. He sees us. He has a photo album full of our images. He desires and longs to comfort us, to rock us, to soothe us, to endure the hard aspects of parenting us, as well as the blessings of it. We, like this darling girl, may get our needs met by other relationships. Physically and emotionally and socially. But, no one can possibly meet our spiritual needs except our Abba Father. No one can tend to all of our needs like a committed Daddy. No one can love and connect and nurture and comfort and console like a parent. Each day that we choose to separate ourselves from His care, He mourns the loss of connection. Because like this precious family, He simply wants us. In His presence. With Him. Curled up in His care. Climbing up in His lap. Enjoying each day together. All barriers and obstacles and distances removed. Like this precious family, He is committed to the process. Of whatever it takes to make us His own. Whatever the cost, He's paid it. Whatever the distance, He's traveled it. Whatever twists and turns and heartaches it involves, if it makes us His child, He'll endure it. And He has. Because He just wants to make us His very own. I see the brutal pain of waiting and longing and enduring a distance imposed by government bureacracy, paperwork, and other barriers. It all seems so unfair. When you have a weeping mother whose arms ache for her child. And a child who needs a mother. Why can't they just be together? In that glorious, joyous moment when they meet and the pain of the separation and what has been melts into a new beginning. I've seen the photos and videos. For years. I've even been the one in the room when the birth mother placed the child in the adoptive parents' arms. There is little in life as profound as that moment, when these individuals are knit into a forever family. And being together at last begins to erase the pain of the troubles to get there. Because its so very worth it. As I wrestle with the questions of why and how this family can possibly be united with their waiting child, I wonder something. Why do I ever run from or doubt the love of my Father? Why do I self-impose a distance between us? Why can't I trust that He is like my dear friend? A parent whose heart longs to make me His? To come together and be held, through whatever life brings? He is waiting. Unlike my friends, I have little to do to be adopted. No government shut down. No paperwork hold-ups. No language barriers or cultural barriers or obstacles at all. All I have to do is to just run into His arms. Because He is waiting with open arms. To hold me today, through all its ups and downs. To comfort me and say, "You are home. You are mine. I've got you. Forever."